353 Waterman, R. Jr., Peters, T. and Phillips, J.R, “Structure Is Not Organisation”, Business Horizons, (3 June 1980). 354 Whitaker et al, “Predicting obesity in young adulthood from childhood and parental obesity”, New England Journal of Medicine, (1997). 355 Jackson-Leach et al, “Estimated burden of paediatric obesity and co-morbidities in Europe. Part 1. The increase in the prevalence of child obesity in Europe is itself increasing. International Journal of Paediatric Obesity, (2006). 356 The Foresight Report (October 2007). 357 Terry Maguire and David Haslam. 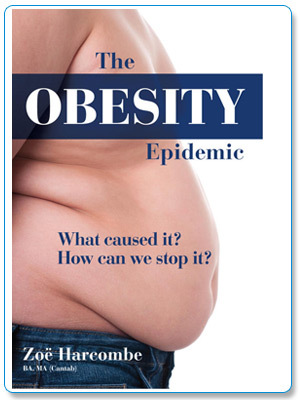 The Obesity Epidemic and its management, published by Pharmaceutical Press, (2010). 358 Fearne Cotton ITV UK, “The truth about online anorexia”, aired 9 April (2009). 359 Her Majesty’s Government PSA Delivery Agreement 12, “Improving the health and wellbeing of children and young people”, October 2007. 360 Health of the Nation Report by the Comptroller and Auditor General HC 458 1995/96 (14 August 1996). 361 The Foresight Report (October 2007). 364 John Yudkin, Pure, White and Deadly, (1972). 365 Dr. Otto Warburg, “The Prime Cause and Prevention of Cancer”, Lecture delivered to Nobel Laureates on 30 June 1966, at Lindau, Lake Constance, Germany. 368 Both definitions are from The Oxford English Dictionary. 369 John Yudkin, Pure, White and Deadly, (1972). 370 Alan Johnson, Member of Parliament and Health Secretary (at the time), Statement to the UK House of commons, 17 October 2007. 371 Liang, Maier, Steinbach, Lalic, Pfeiffer, “The effect of artificial sweetener on insulin secretion”, Hormone and Metabolic Research, (1987). 372 One of the forecasts of the Foresight Report: “Tackling Obesities: Future Choices” (October 2007). 374 David Kessler, The end of overeating, Published by Rodale, (2009). 375 Kelly D. Brownell and Thomas R. Frieden, “Ounces of Prevention – The Public Policy Case for Taxes on Sugared Beverages”, The New England Journal of Medicine, (April 2009). 376 Nielsen SJ, Popkin BM, “Changes in beverage intake between 1977 and 2001”, American Journal of Preventative Medicine, (2004). 378 (*) http://www.sustainweb.org/pdf/Thirsty_Play.pdf. Christine Haigh and Jackie Schneider, “Thirsty Play: A survey of drinking water provision in public parks” (May 2010). 379 Cremieux PY, Buchwald H, Shikora SA, Ghosh A, Yang HE, Buessing M, “A study on the economic impact of bariatric surgery“, The American Journal of Managed Care, (September 2008). 380 The Association for the Study of Obesity Annual Conference, Liverpool UK, (June 2009). 383 Charles Clark and Maureen Clark, “The Diabetes Revolution: A ground breaking guide to reducing your insulin dependency”, published by Vermillion, (June 2008).